As Sleeping Beauties and Beasts, Book 4 of Hands of the Highmage is being edited, I’ve been working on my Dare2believe Series. The second printing of the first book of the series is now available on Kindle. The second printing of Double Dare will be appearing on Kindle in a few months, followed by the debut of Triple Dare. Triple both parallels events in the first book in the series, taking us back to the rise of the pandemic elsewhere across the globe and continues the tale from where Double Dare left off. In Triple you’ll meet characters only briefly seen in Dare2believe. A prequel story to Triple Dare, Family Dragon, featuring some of those characters can be found in my short story collection, Crossroads of Sin. If you have read my Highmage’s Plight and Hands of the Highmage Series, you’ll find the contemporary end of the world as we know it Dare2believe Series is a meta-version of those series. Think of it as a weird Waldo, looking into a mirror, looking into a mirror story, where fans of the Plight find themselves becoming their favorite characters. The idea behind the series will become clearer by visiting my website at www.dhr2believe.net. My goal is to one day create a two sided map of the Enchanted Universe Theme Park, with the other side being the world of the Elvin-Human Empire. Yes, I did write “theme park.” Because of the meta nature of this series it has spoilers and insights into the Highmage’s Plight and Hands of the Highmage Series. 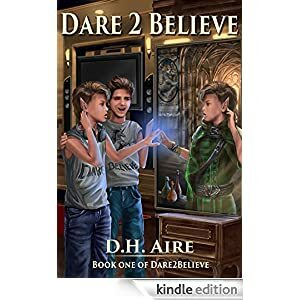 So, whether you are new to my stories or not, Dare2believe can be enjoyed as a stand-alone series, or be a complimentary one to my completed Highmage’s Plight Series and the ongoing Hands of the Highmage Series.